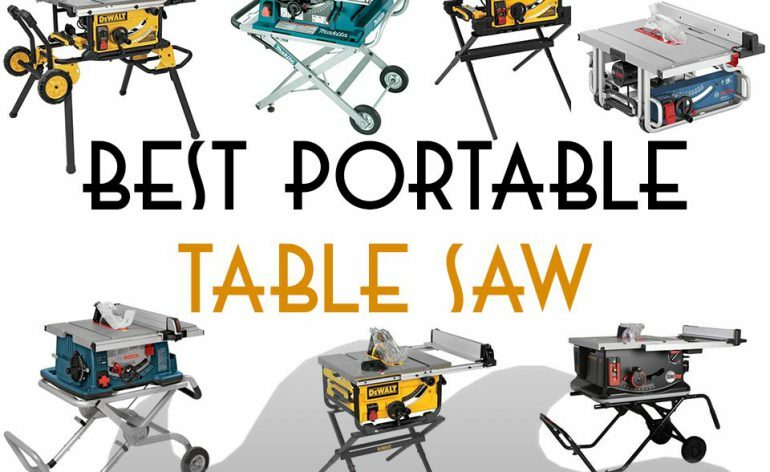 It’s now the second half of 2015 and it seems a lot has changed in recent years in the world of portable table saws. Manufacturers have worked hard to release new and more innovative saws, addressing many of the shortcomings of their predecessors. Thankfully, we have seen a greater shift towards table saw safety with manufacturers like SawStop and now Bosch bringing out their ingenious flesh detecting technology. Competition is fierce in the portable table saw market, which is a great thing for us, the consumer, because it’s forced table saw manufacturers to really dig deep and go that extra mile to make sure their offerings stand out above the rest. And there truly are some great saws out there. So how did I arrive at this list? I came up with this list of seven saws, by really researching what is around at the moment. My focus was on features, quality, innovation and of course portability. I wanted to know what saws woodworkers are using now, what are they buying and why. It was important to me to make sure that I captured and properly evaluated data on newer saws that may not have had the coverage of their predecessors. But equally, older saws still made the list if they had the features to compete. Now we can look at the dimensions of the table tops to get an idea of how big these saws are to move around and stow. Some of you will be looking for a big table because you know that you need the support a bigger table offers, to be able to cut larger materials, where some of you will be more than happy with the smallest table available because you know that you won’t need any more. 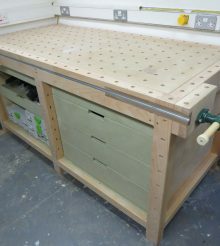 As you would expect the DeWalt DWE7480XA and the Bosch GTS1031 also have the smallest tables of the 7 on test and the SawStop, which is also the heaviest, also has the largest table. All of the saws, apart from the Bosch GTS1031 (available as a optional extra GTA500 for $79) come with some sort of stand. The Makita 2075, Bosch4100-09, SawStop JSS-MCA and DeWalt DWE7499GD all have their own fold down stand with wheels, where the saw remains fixed to base. The Bosch 4100-09 comes with the “Gravity Rise Stand” also available separately as the Bosch TS2000 if you want to use it with a different table saw. It comes with 8 ” pneumatic wheels to allow you to move around the job site and sets up and breaks down in one fluid motion. Have a look at this video to see it in action Bosch Gravity Rise Stand. The SawStop JSS-MCA has a similar stand to the Bosch, It too sets up and breaks down in one fluid motion and has 8 ” pneumatic wheels. The Makita 2705X1 has a type of scissor stand. Its available separately as the Makita 194093-8 If you wanted to use it with another saw. Unlike the SawStop and the Bosch 4100-09 the Makita has rigid rubber wheels, so you never need to worry about them going flat, but they will struggle more on rougher terrain. The stand has pressurized cylinders on both sides to help you setting up. The DeWalt DWE7499GD rolling stand is more simple than the others mentioned, but just as effective. The legs individually fold out from underneath the stand. By placing a foot in front of one the rolling stands legs and tilting it level you’re ready to go. When assembled the stand gives you a 40 ” x 40 ” stable area. For ultimate portability alone, it’s very close between the Bosch GTS1031 and the DeWalt DWE7480XA. And for me the DeWalt just edges it. It has produced a very light, compact saw that is still capable of being able to rip full size 4 ‘ x 8 ‘ sheet materials. OK so there are better stands on test here, but the scissor style that comes with the DeWalt is simple and works well. The weight of these 2 are probably just light enough to carry over shorter distances, but if portability without a vehicle is high on your list, I would look at one of the other saws or buy the Gravity Rise stand on its own. The Bosch 4100-09 I feel needs a special mention for its brilliant “Gravity Rise Stand”. Although bigger and heavier the stand really is very clever, allowing for quick set up. The rugged 8 “ wheel’s make it easier to wheel over rough terrain around the job site. The SawStop JSS-MCA also has a very clever cart like stand which incorporates rugged wheels and allows you to easily set the saw up. But at 108 lbs with the stand you really are going to need it. So looking at the list above we can now see that the all of the saws, apart from the Bosch GTS1031 is capable of ripping a full size sheet of ply in half. Also as you would expect, the SawStop is not only the heaviest table saw on test and has the biggest table size, but with the telescopic wing it has a very impressive maximum rip capacity of 32-1/2 ”. All of the saws on test here take a 10 “ blade with a standard 5/8 “ arbor. This gives you plenty of choice when it comes to aftermarket blades. Most of these saws have the ability to add a stacked dado set. We can see from the list that most saws can accept a stacked dado set. The only one that can’t is the DeWalt DWE7480XA. This is due to the shaft for the blade not being long enough to mount the dado blade. I was impressed to see the Bosch GTS1031 being capable of mounting a dado blade even though it is slightly smaller than the rest at 1/2 “. There are two measurements here, the maximum depth of cut at 90 degrees and the maximum depth of cut at 45 degrees. And it’s good to see that there isn’t too much of a difference between the saws here. I was surprised to see that the Makita has a slightly larger max depth by 1/2 inch than the rest of the saws here. Now all the saws on test here use some type of 15 amp brush motor. The reason for this is that they a lot lighter and more portable than induction motors, which are more commonly found in the bigger stationary cabinet/hybrid and some contractor saws. Brush motors are also a lot louder than their induction cousins but the use of soft start features make using these saws a lot more pleasurable than they used to be. The Bosch being one of smallest saws here has packed an amazing motor into this table table saw. The DeWalt table saws make use of their newer motors which are definitely more powerful than their predecessors. The motor in the Bosch 4100-09 still produces the same 4HP that the GTS1031 does but spins slightly slower a 3650 rpm. The quality of the fence and miter can make or break the perception of the saw. If the fence doesn’t move easily and fix securely and accurately it really doesn’t matter how good everything else is. So that’s why the fence and accessories have to be good. The Bosch GTS1031 used Bosch’s award winning “SquareLock” rip fence technology. The fence runs smoothly along the measuring rail and when the button is pressed it locks itself square to the blade. Force is applied at both the back and front of the saw so you can be confident that the fence won’t move. The GTS1031 has a two standard square miter slots, which means that you can use the miter guage provided or one of the many aftermarket miter gauges available. The DeWalt DWE7490X, DWE7499GD and the DWE7480XA all use the same style rack and pinion fence system. This means that the fence is easy to adjust and smooth. It sets easily and locks into place perfectly square to the blade. The DeWalt table saws also come with a standard square miter slot. The Makita 2705 comes with a pretty standard locking fence. It moves smoothly and when locked down, locks at both the front and the back of the saw. The Makita 2705 comes with “T” Style Miter fence. The SawStop JSS-MCA has a very innovative T-style fence that incorporates the locking button on the top on the fence, meaning there is no lever to possibly get in the way. It runs smoothly on the measured rail and locks in place securely and perfectly square to the blade. 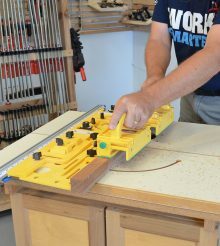 The SawStop uses the T style miter slot, so you can use the miter guage that comes with the saw or purchase one of the many brilliant after market T style miter gauges. The Bosch 4100-09 uses a pretty standard locking fence, It runs smoothly on the rail and locks into place square to the blade. The 4100-09 makes use of the “T” miter track. The SquareLock fence found on the GTS1031, the T square-style fence found on the SawStop and the the rack and Pinion found on the DeWalts are brilliant. The rest are perfectly adequate and will lock securely and square to your blade. 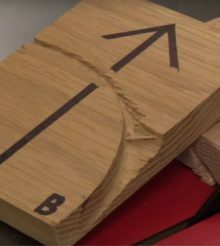 I personally prefer the T style miter slots so I know there is no risk of the gauge lifting when cutting timber and it would have been nice for me to see these on the DeWalt. With over 33,000 table saw injuries reported every year in the United States, table saw manufacturers have finally woken up to table saw safety. There are a whole array of safety features that manufacturers are using now, some brilliantly simple like using a riving knife or anti kickback pawls, to the ground breaking flesh detecting technology from the likes of SawStop and more recently Bosch with their Reaxx range of table saws. So let’s first look at the SawStop JSS-MCA. This saw is a recent addition to the SawStop range of table saws and the safety features alone probably warrant its own article. It is the only saw in the list that comes with flesh detecting technology. If you are not using the blade guard and your finger should touch the spinning blade, the blade instantly drops away below the table and a brake is applied to stop the blade instantly. OK, so it’s worth noting that you will need to replace the brake cartridge and blade. But I’d rather pay for these and still have all my fingers! If you know you are going to be cutting wet wood that could cause a false positive on the flesh detecting technology, this can be overridden on a case by case process. The JSS-MCA also has a very effective blade guard system consisting of a riving knife and anti kickback pawls. The Bosch GTS1031 and the 4100-09 uses their own “Smart guard system”. It’s a quick and easy-to-use modular blade guard with anti-kickback pawls and riving knife. No tools are needed and it can be installed and removed in seconds. The DeWalt DWE7490X, DWE7499GD and the DWE7480XA all make use of the “ITE-PRO™ MODULAR GUARDING SYSTEM” This is a tool-less blade guard system that consists of a rise and fall riving knife, blade guard and anti-kickback pawls. The system can be assembled in approximately 30 seconds. The Makita 2705 is another saw that makes use of a tool-less modular blade guard with an adjustable riving knife. The tool-less modular blade guard system has an adjustable riving knife and two on board and independent stowable anti-kickback pawls and riving knife/spreader for through cuts. Well you probably guessed it but the SawStop wins this round. Without the brilliant flesh detecting technology then this round is pretty much a dead heat. All the portable table saws here have modular blade guards with riving knifes and anti-kickback pawls which all do a very good job of keeping fingers away from blades and preventing kickback. No matter where you are going to be using this saw, it’s probably important that you have a way a way to deal with dust. And I’m please to say that all but one table saws here come with a dust port. The only exception is the Makita 2705 which relies on you regularly clearing dust from the bottom of the saw. They all vary slightly in size so it really does depend on what’s the diameter of your dust collection setup. Well we have seen some great saws here and I hope this portable table saw guide has given you all the information that you need to make your table saw choice. We’ve seen the ultra-portable saws such as the DeWalt DWE7480XA and the Bosch GTS1031 through to the bigger heavier and incredibly safe SawStop JSS-MCA. The DeWalt DWE7480XA has really impressed me, not only is the lightest saw here at 48 lbs, its ripping capacity means that you can use it to rip a huge range of materials including full size sheets of plywood. The rack and pinion fence system is smooth and accurate and sets perfectly square to the blade every time. And it’s also amazing value at approx. $400. This is a great saw and you can really see where DeWalt have managed to improve on their incredibly popular DW745. I’m sure a lot of people would have liked the ability to use a stacked dado on this saw, and if you really need this feature, then Bosch GTS1031 may well be the saw for you. If you really need the ability to cut dado’s and full size sheet materials, I would probably look at the very impressive DeWalt DWE7490X. It’s portable, reasonably light, comes with the separate scissor stand. It can cut 13/16″ dado’s and can handle full size 4 ‘ x 8 ‘ sheet materials.